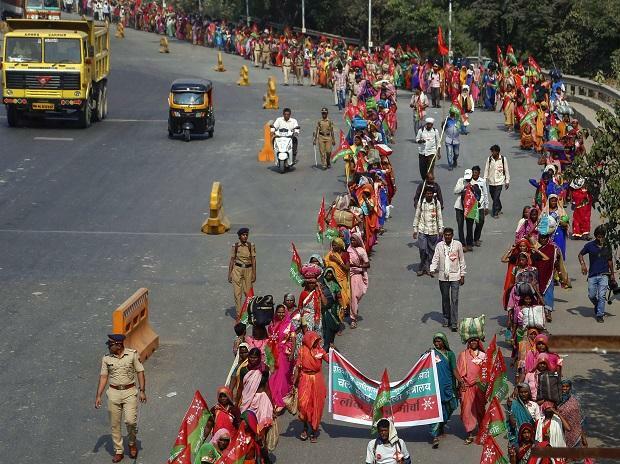 The farmers' long march from Nashik to Mumbai will continue after their leaders' late night parleys with Maharashtra government to address their demands remained inconclusive, the march organisers said Thursday. Farmers have embarked on a 180-km march from Nashik to Mumbai for the second time in the last 12 months to protest against what they termed as the "betrayal" of peasants by the BJP governments at the state and centre. The march could not be taken out Wednesday as police stopped many farmers from reaching Nashik, the AIKS claimed. Maharashtra minister Girish Mahajan met some AIKS representatives in Nashik Wednesday night. "We held talks with the minister for over three hours. The government appeared positive to 80 per cent of our demands. The minister said he would speak to Chief Minister Devendra Fadnavis first," AIKS president Ashok Dhawale said. Dhawale said Mahajan informed AIKS representatives that the assurances would be given in writing. "The AIKS has decided to go ahead with the march beginning Thursday morning till the government does so," he added. Dhawale said police were also present during the meeting with Mahajan. They (police) are not going to stop the farmers now, he added. Mahajan could not be reached for his comment. The AIKS has accused the government of not fulfilling assurances given to farmers last year after they marched between the two cities, seeking farm loan waiver, minimum support price for crops, irrigation facilities and provision of pension to agriculturists. The AIKS also said it is opposed to the multi-billion dollar Mumbai-Ahmedabad bullet train project which has seen several farmers along the proposed route approach court against land acquisition.